Waking up at four in the morning to go gorilla trekking was not the most ideal way to begin the “trip of a lifetime.” Although we were told that the ride showcased Rwanda’s natural beauty, we fell asleep almost instantly (despite the rocky terrain). We only woke up when our stomachs grumbled for granola bars (man, we had a lot!). After four hours of driving, we finally arrived at our destination. We had our first encounter with a Rwandan bathroom and laughed about our safari outfits. We heard that there were two possible treks: the difficult and longer trek or the beginners’ walk. Having played sports our whole lives, we assumed that we were adequately equipped to handle the challenge. We thought wrong! Warning: Gorilla trekking is not for the average human. As we huffed and puffed up the beautiful hills, we passed waving children in small mud huts along the way. We were so surprised to see the enthusiasm and friendliness they showed towards us, complete strangers. However, soon we were more focused on our aching legs than our beautiful surroundings. Finally, we spotted our first gorilla. We spent an hour observing different members of the Agashya family in their natural habitat. Our guides made strange noises in the back of their throats to tell the gorillas we came in peace. We were mesmerized by how similar the gorillas were to humans and how calm and peaceful they appeared. We even learned that when the gorillas pounded their chests, it was not done in aggression but rather in camaraderie. Although we had seen photos of the mountain gorillas, nothing could have prepared us for this experience. The silverback, the dominant male of a gorilla family, was three times the size of the average man. Although his size was surprising, we were more interested in the mother and baby. The mother playfully held her four-month-old baby with tenderness and care, just as you would find in our culture. We laughed at the little baby’s fluffy Mohawk and were sad to leave. After the trek, we watched a local soccer match and took photos with the children. They were so eager to be photographed and to look at photos of themselves on our camera screens. It was amazing to see how something that seems so normal to us, such as taking a photo, was completely foreign and exciting for there children. After spending the night in the lodge, we set out for another day of trekking. This time, we did a much easier trek in a more densely forested setting and we were lucky enough to see twelve gorillas all at once. On the ride back, we yet again consumed granola bars, but this time we decided to eat while watching our surroundings. The rumors were right: Rwanda is definitely the Switzerland of Africa. Our first activity upon arriving in Kigali was to visit the Genocide Memorial. Although it was extremely sad, we were happy to go and finally learn about the genocide. Learning the extent of the horrors that occurred amazed us. After visiting the Genocide Memorial, we can now fully appreciate how willing Africa was to forgive and move forward. Berra, the country director of Women for Women International-Rwanda, stressed the importance of sharing the story. She told us to “go home and tell everyone.” At that moment, we realized our role as the next generation. We learned that knowledge and understanding are the most powerful tools in fighting genocide. After the memorial, we visited the Women for Women offices and classrooms. We were greeted by dancing and singing women. We were honored by the welcome we received and grateful for their openness and acceptance of us. We went to a Social Networking class and observed an average lesson for the women. The teacher explained to the women that relying on and working with their neighbors is more effective than working alone. It surprised us that this was not second nature for them. “Ubudehe” means to work together, and this is one of Women for Women International’s most important messages. They acted out skits demonstrating times when having friends was beneficial. At the end, the women were given the opportunity to ask us questions. They asked us to say hello to everyone in America and wondered if we had cooperatives back home. They said they were grateful for us taking the time to visit and learn about their culture, but we felt the opposite was true. They certainly had given us more than we could ever give them. Unfortunately, one baby did not feel the same way. He promptly burst into tears when our crazy pal Liz tried to pick him up. After the class, we were given an opportunity to buy handmade goods from the women. We also ate lunch with employees and listened to their stories. One thing that really struck us was how every single person we met had an equally touching past. We felt insignificant hearing what they have gone through and comparing it to our lives. Another surprising aspect of the lunch was learning that the women did not know to say “Thank you” when we purchased their homemade crafts. What is second nature to us did not even occur to them. Women for Women teaches their students aspects of our lives that we take for granted such as the following: health, cleanliness, family law, education and management skills. The next excursion was one of our favorites because we were greeted with such excitement! The whole group went to visit a school and as soon as we arrived, we were surrounded by little girls and boys. They seemed so happy to see us and immediately sang for us. They grabbed our hands and took us to their classrooms where they jumped and laughed with us. Seeing them so excited with our visit made us so happy. The impact we seemed to make on them made us grateful for the opportunity and we realized that although the kids were the ones jumping around in excitement, the excursion was just as exciting and gratifying for us, if not even more so. When we went to visit a women’s cooperative, we were once again greeted by song and dance. It was very interesting visiting the cooperative because it showed us what the women take away from Women for Women’s training. We saw how each woman received their own plot of land where they harvested different crops. We all went through one plot of land grabbing bean pods, and we saw how fast work goes when we work together. Although each woman maintains their own individually plot, they work together and act as a community which makes the work easier for everyone. They gave our group two pineapples to thank us for visiting them although we felt that we should be thanking them for sharing their lives and stories with us. Pineapples take about a year and a half to grow, so we were especially touched by the generosity. While at the pineapple farm, we had the opportunity to speak with an extraordinary woman whose story only reaffirmed the importance of Women for Women’s work. The single mother shared the story of how her life changed with Women for Women. Before joining the organization, she was abused by her landlord. When she could not pay exactly when he wanted, he would steal her two children’s food and beat her. She and her children often went to sleep hungry and scared. When she joined Women for Women, however, she learned that she did not need to tolerate this treatment. She also earned enough money to buy her own small house and a calf, feed her family, and send her children to school. We were both shocked and inspired by how much the women’s lives had changed as a result of participating in Women for Women International’s program. We were saddened by their personal struggles and deeply proud of their great accomplishments. Another excursion that we found particularly interesting was our trip to the Commercial Integrated Farming Initiative (CIFI) farm. Women both raise animals and grow many different crops on the CIFI farm. We were amazed by how the women utilized each and every part of the land, wasting absolutely nothing. The way they organized the animals and the vegetation was incredibly efficient and practical. For example, there was one structure that housed three or four animal groups on top of each other. By placing the rabbits on top, the rabbit debris fertilizes the grass which the goats underneath eat. They even use horse dung to generate power. These inventions and structures utilized everything resource available at the far in order to produce as many products and as much profits as possible. After visiting the farm, we went to Gahaya Links. Gahaya Links employs many Women for Women graduates. These women create baskets and jewelry that are sold both to visitors and to big companies in America, like Anthropologie and Kate Spade. It was really cool to go behind the behind the scenes and see how products we buy at stores in D.C. One of the greatest aspects of Gahaya Links was how Joy, the founder, required the women to practice good hygiene and to save their money, reinforcing the skills the learned through Women for Women’s program. She genuinely cares about the women she employs and this is something that cannot always be said about employers in the developing world. Having visited the businesses of Women for Women graduates, we were lucky enough to be invited to Women for Women graduation ceremony. Although we arrived late, the women were thrilled to see us, and five or six of the women shared stories of gratitude. We were touched by their personal stories, and we felt that we did not deserve their praise. They are the incredible ones, not us. After these speeches, a few women performed a skit. They depicted a woman with two kids and an alcoholic husband. The drunken husband did not understand why the woman joined Women for Women, and so the children explained all of the benefits of the organization. After beating his wife and getting drunk a few more times, he finally realized that the organization benefited the whole family by giving them the tools they needed to obtain a steady income. Women for Women taught the mother to fight the abuse, and eventually convinced the husband that man and wife should have equal power in the relationship. On our last day in Rwanda, we once again saw how the genocide impacted the country. We visited an orphanage that was open during the genocide. It houses the children of genocide victims and protected them in 1994. We spent the day cleaning up the area with the kids, because every last Saturday of the month, all Rwandan citizens participate in cleaning up the country. This, as well as the plastic bag ban, is a cleanup measure that the country has really benefited from. After cleaning up with the kids, some of the teenagers showed us their rooms. One bed particularly made an impact on us. Rather than having a blanket or even sheets, it only had a Twister mat on top of a mattress. Despite circumstances like this, the kids were extremely joyful and hula-hooped with us. We taught them to play Limbo and played soccer with them. One problem the orphanage faces, however, is what to do with the kids once they turn eighteen. They do not have the funding to send them to university, nor do they have enough money or facilities to keep them at the orphanage. It was heartbreaking to see the difficulties an organization that is doing so much good faces. We vowed to help as much as we could, but learned that mailing blankets and art supplies was not always helpful as items are often stolen before reaching the orphanage. This was perhaps the most difficult part of visiting Rwanda. We saw so many people and places that needed our help, but we did not always know how we could help. Seeing women and children so optimistic and happy with so little made our desire to help even stronger. W learned that one surefire way to assist was just to share our experiences. By telling everyone we know what we saw and how we felt, the opportunities for additional aid for and knowledge of Rwanda increases. Knowledge is the most important tool in both preventing future genocides and doing our part to help the victims of Rwanda’s genocide. Sharing our experiences is the least we can do after the people we met and the stories we heard gave us more than we can possibly express. My Women for Women International trip to Rwanda with my family was one of the most meaningful experiences we have had together. It is hard not to fall in love with the country’s rolling hills, vibrant colors, spirited music. And it is impossible to ignore the power of the rebuilding and the reconciliation taking place. As a nineteen year old, the Rwandan genocide of 1994 occurred in my lifetime. The young girls that survived its unfathomable cruelty are my age. During one of our last days in Rwanda, our group attended a Women for Women International graduation. We listened as women who had completed their first year of the program recounted their stories and the ways in which Women for Women had changed their lives. The entire ceremony glowed with hope for a future in Rwanda. One part of the ceremony in particular will stay with me forever. One woman, clad in deep blues and reds talked of losing her husband and two of her children in the genocide. Women for Women had allowed her to send her other children to school, to build her family a house, and to continue providing for her family on her own. In her wake, another woman, much more serious and dressed in a long, pale yellow dress, began to speak. As one of our guides quietly translated for my siblings and I in English, I was shocked. This woman had spent eight years in jail for the murders she had committed during the genocide. I thought I had heard incorrectly, but when the translator assured me I had been right, my disbelief changed into something else. The woman continued to say that without her husband, still in jail, she had no way of sending her children to school let alone feeding or housing them. Women for Women granted her the independence and abilities to fully support her family. The pale yellow and red blue figures stood and swayed side by side during the rest of the ceremony. That moment for me, was truly incredible. Women for Women had brought these two women together, two women with very different stories, and helped them both rebuild their lives. Conflict is never black and white. I learned from this moment, and from this trip that sometimes to resolve conflict we must move on from the grey. Women for Women does not discriminate or judge, they have and continue to help all of the women they can. This kind of help is the only way to reconcile, the only way to forgive, the only way to rebuild. 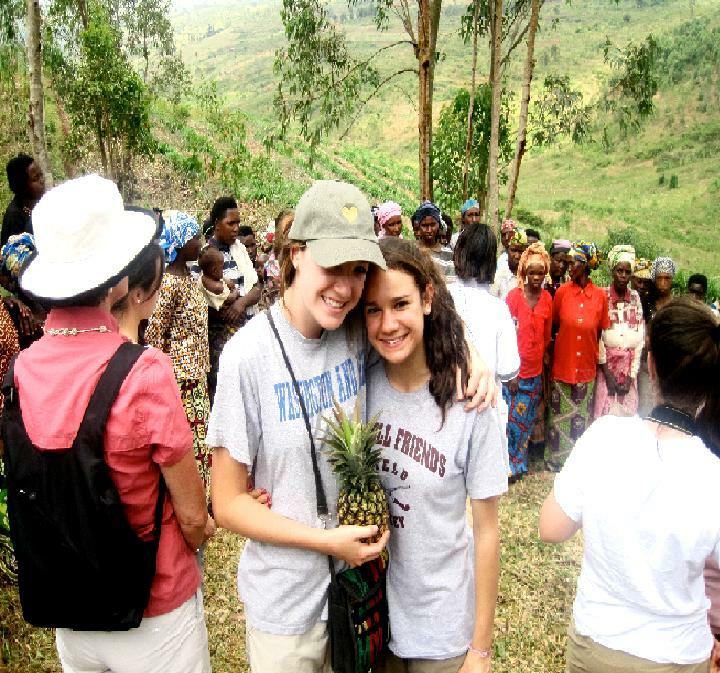 Molly Bernstein traveled with her family to Rwanda in August as part of a Women for Women International donor’s trip. Walungu, DR Congo, June 22, 2010 || During my last day in DRC, I toured some “in-the-works” projects. Due to the success of the Commercial Integrated Farming Initiative in Rwanda, WfWI-DRC is now in the first stages of launching the country’s own large-scale organic farming program. In Walungu, the densest populated territory in both North and South Kivu, 90 hectares of land was granted by the local leader at little cost to WfWI. The King of Walungu, as he is known, provided the land to WfWI participants and graduates from the area for the next 30 years. He saw the progress our participants made on the 12 hectares of land he provided for our organic training fields is benefit to his community. Next week, our agribusiness experts will analyze the soil, measure out the plots of land to be farmed and owned by the participants, and formalize a management plan for the three-year project. 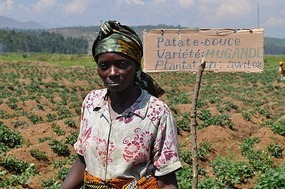 Like the program in Rwanda, 1000 women will be trained in organic farming techniques per year; following their year of training they will own their own plots of land and will form into large-scale cooperatives. Organic Farming Participant in Walungu. The trainer is already providing our participants with a grab-bag of farming techniques that they will rely on after they graduate. At the training site, a large number of different crops are cultivated in a variety of methods. Tomatoes are planted using a terraced technique and a large field approach. The farmers will compare these two methods, carry out the process through harvest, and then decide on what works best for their plots of land for future cultivation. Gilbert, our Income Generation Manager, points out nearby plots of land that are owned and tended by non-WfWI farmers and shows me the differences in farming practices. You can clearly see that the WfWI land is better-organized, producing a healthier and lush crop outcome, and utilizing innovative irrigation and planting techniques. At a neighboring farm, Gilbert sees two women who are burning weeds they picked on their land. He pauses our conversation to talk with them to explain that this will make their soil infertile and that they should stop this traditional practice. He sees that some farmers, however, are copying the organization of the WfWI demonstration farm, and is pleased that some of our participants’ techniques are spreading to other plots in the community. Gilbert then takes me to our training facility in Burhuza. One of the key programs there is our bread-making initiative. Participants were hard at work, pounding out dough, forming small rolls and loaves of bread, waiting for it to proof and rise, and baking it in their double clay oven. After the training session, we went to the small village of Mushinga near Burhuza. Gilbert wanted me to meet three entrepreneurs who started a bread-making operation where they live. All of the equipment was purchased by the participants using their sponsorship funds – a single clay oven, two large baking trays, a bread mold, a used oven cover, a large table – totaling $125USD. All this, and they have not even graduated yet. 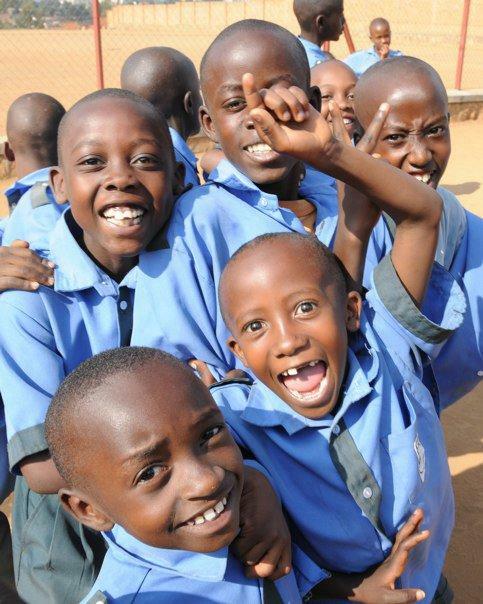 In July, when they complete their training, they will receive the $60 each that they saved throughout the year. They plan on using it to grow their capital so they can increase the quantity of production. Because of the quality of their bread, which is well-known throughout Mushinga, they were recently asked to produce a large order for a wedding in the village. The demand is high, but they are struggling to keep up with the requests. In addition to using their savings, they will be able to access a micro-loan to grow their business and meet the needs of the village. Gilbert is also looking to grow the bread-making program and make the training available to more participants. 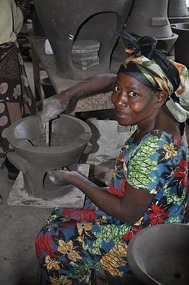 Currently, 1067 women are enrolled in the bread-making vocational training, in nine out of the 12 sites in DRC. He is pleased with the initiative of the three participants and plans to help others build ovens and start a small operation in their villages as well. This way, the women can earn income while training, like the three entrepreneurs. From guinea pig breeding to tile-making; organic farming to culinary arts; bread-making to tailoring – the participants at Women for Women International are making an investment in themselves, their families, and their communities. Each woman I have met along the way has a new-found passion for her vocational training, a drive to succeed, and a determination to chart a new path in life. In the short time I have spent in Rwanda and DRC, I have encountered participants at every stage in their year-long development – learning life skills such as the importance of voting and civic participation; discussing nutrition and basic hygiene; receiving their sponsorship funds; starting their vocational skills training; learning how to count; utilizing organic farming techniques; graduating from the program; and becoming new entrepreneurs in their communities. Gilbert Kajabika, Income Generation Mgr., DRC. I can 100% report that your continued and generous support is making a HUGE difference in the daily lives of the women we serve and their families. Our staff continues to come up with innovative ways to engage our participants and ensure that they will graduate with the knowledge and skills they need to be active participants in the social, civic, and economic advancement of their communities. Thank you to all the Women for Women International staff in Rwanda and the Democratic Republic of the Congo, especially: Berra Kabarungi (Country Director, Rwanda); Christine Karumba (Country Director, DRC); Gertrude Mudekereza (Director of Programs, DRC); Patrick Njakani-Okoko (Goma Sub-Office Manager, DRC); Gilbert Kajabika (Income Generation Manager, DRC), and John Chuma (Sponsorship Translator, DRC). You have made my experience in your countries very enjoyable and educational. I look forward to relaying the many stories of the women we serve and our dedicated staff to our loyal supporters. Liam Dall is the Senior Major Gifts Officer at Women for Women International. He traveled to Rwanda and DR Congo in June 2010. Bukavu, DR Congo, June 21, 2010 || Today, our Bukavu team showcased the many ways our participants are generation an income, following their numeracy and business skills training. Together with our Income Generation Manager, Gilbert; translator, John; and driver, Roger; I set out to see the variety of ways women are putting into practice the vocational skills they learn throughout their training. First on the itinerary was a stop at the Wavumu training farm where 607 women are learning new methods of cultivating the land. 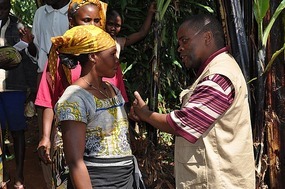 Gilbert explains that in this part of DRC, the women traditionally grow Cassava for the leaves and roots. This crop, however, can only be harvested once a year, and is sold cheaper at the market than other produce. Women for Women International teaches our participants how to cultivate crops that grow faster and are more economical. At Wavumu, the women are producing crops such as potatoes and carrots that are harvested two times a year and are in greater need at the market. Today, the participants are weeding the land and are making sure the soil is at level with the potatoes which are set to be harvested in August. Within this two hectare plot of land, the participants are also growing tomatoes, onions, eggplant, and cabbage. When asked what the biggest challenge is for the women farmers, I was told that many times, soldiers will steal their crops at the moment of harvest. A nearby field had almost half of its maize harvest taken. WfWI has recently employed two security guards to deter this behavior. Close to the farm is the Wavumu Training Center where the participants attend their life-skills, numeracy and business skills training. Gilbert wanted to stop by to give their trainers income generation plans for the participants to complete. While there, we listened in on a class that was reviewing each of the business skills lessons and preparing to start their vocational skills training in July. The trainer was testing the women on terms and practical situations learned throughout their training such as how to greet a customer; where in the market to sell their products; and how to keep a log of expenses, savings, and credits. After class, Gilbert asked all the groups to gather in the courtyard for instruction on how to fill out their individual income generation plans with their trainers. This will be their roadmap for the next six months as they start training in the particular job they chose as their marketable skill. He underscored that each participant needs to know where they are and where they are going. They should update their plans as they progress and always keep their hearts and minds set on their goals. In six months time they will receive a certificate of graduation. This will symbolize all that they have learned throughout the year. At the training site, I noticed three women making soap. They are part of a 20-woman cooperative and graduated three years ago. Gilbert has asked them to prepare their products at the training center so that the current participants can be motivated to work hard and one day make products to earn an income like them. A bit down the road we stopped into a small restaurant and store owned by a former participant. Two of her children were behind the counter and a baby strapped to her back. A man was also in the restaurant. I asked her if he was her husband. She laughed and said, no, he was her employee. Following the training center, we visited the WfWI Ceramic Studio and Tile Production Center. Over 200 women are trained here in the production of traditional products such as cooking pots, water boilers, and planters; and construction products such as tiles. Our guide through the facility is a woman named Mariette who graduated from the first group trained in ceramics four years ago. She is now teaching her craft to the current participants. She said that her life before WfWI and her ceramic training was a big struggle. She could not feed or send her children to school. She used to travel very far from her home in search of pieces of charcoal. She can now do things that she never thought were possible like buy firewood, have enough food for her family, and pay for school fees for her children, even past primary education. As for her ceramics skills, she had no idea it was in her to create so many products. She loves ceramics and will never abandon the activity. She is now a grandmother and one of her own daughters is a current participant at WfWI. Participant Making Traditional Ceramic Cooking Pot. Mariette introduced us to some of the women doing various jobs. A number of women were mixing the clay manually – a very difficult and time-consuming task. Gilbert said that they recently purchased machine mixers to this job to save the participants time and energy. Next we visited with some women making tiles in various shapes and sizes. Many of these tiles are being produced and will be purchased for the Women’s Opportunity Center in Kayonza, Rwanda – an effort that will generate income and be a symbol of peace among the women of the two countries. Finally, we spoke with participants who were making clay cooking pots. Each woman can make two pots per day. These take two weeks to dry, or up to one month in the rainy season. They are sold for $5USD each. These participants plan on expanding the ceramics program after graduation closer to where they live. Five women have come together to purchase and provide plots of land to be used for the activity. 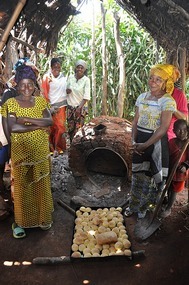 A kiln will be their next purchase and will be used by the women of the community to produce their wares. Before ending the day, Gilbert had one more stop planned. He took me to a partner cooperative called ACOSYF that displays the final products of Women for Women International participants: soap from our soap makers; clay cooking pots and ceramic decorations from our ceramics participants; baskets and bags from our weavers; cloth flowers from our tailors; and other items. This partnership is an example of one of the final pieces to our income generation strategy where we help secure the market linkages for our participants and graduates so that their new skills and hard work literally pays off. Goma, DR Congo, June 20, 2010 || Many supporters and sponsors ask me about how the direct aid is given to the women each month. 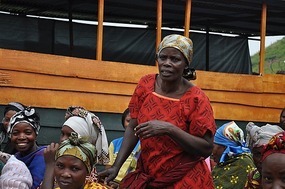 In Goma, the participants are part of a credit and savings cooperative – a pilot program initiated by WfWI to meet the savings objective of Project ESPOIR. According to the expectations set by USAID, at least 50% of the women must save through a formal institution. The partnership set up in Goma with a local credit and savings union called Mutuelle D’Epargne et de Credit de Ndosho ensures that all women in our Goma program are saving a portion of their sponsorship funds through these formal channels. Each woman goes to the credit and savings co-op on a specified date each month. The cashier asks for the participant’s name and the name of her WfWI training group. After identifying the woman based on her name and her picture, the cashier administers the sponsorship funds. 30%, or $3USD, is deposited into the woman’s savings account; 70%, or $7USD, is given to the woman to use as she sees fit – food, school fees, clothing, and capital to grow small businesses. The participant signs her name or makes an ink thumb-print next to her name and savings amount. Upon completion of the year-long program, the woman will have saved $36USD, sometimes the largest sum of money they have seen at one time. This way, the women are guaranteed to have a large portion of funds available to them at the end of their training to reinvest in their businesses and advance their economic activities. They are also eligible for micro-loans and small credits for being part of the cooperative. Participant Receiving and Saving Sponsorship Funds. Faida, the graduate who was highlighted in my last story, says that the women are very lucky to have such an opportunity. This was not available to her during her training. She encourages the women to continue to save even after graduation and to take advantage of this opportunity. This way, their husbands cannot take their money. It is in a safe place, growing and maturing each month, just like them. Today I left Rwanda to visit some of our programs in the Democratic Republic of the Congo (DRC). Patrick Njakani-Okoko, WfWI Sub-Office Manager for North Kivu Province, meets me at my hotel and escorts me across the DRC border 2.5 kilometers away. He prepares me that I will see quite a difference from the Rwandan side of the border. North Kivu province is one of the richest areas in the world in terms of minerals, agriculture and other natural resources. It is also one of the most dangerous places and continues to see conflict flare up by militia and rebel movements vying to take control of mines, farms, and key locales. For a woman, this brings the added threat of sexual violence and mistreatment. 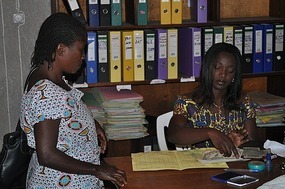 Women for Women International has a large presence in North Kivu, with a regional sub-office in Goma, where over 4,000 women have been trained since 2006. Patrick tells me about a new program implemented in 2010 call ESPOIR – ‘hope’ in French. 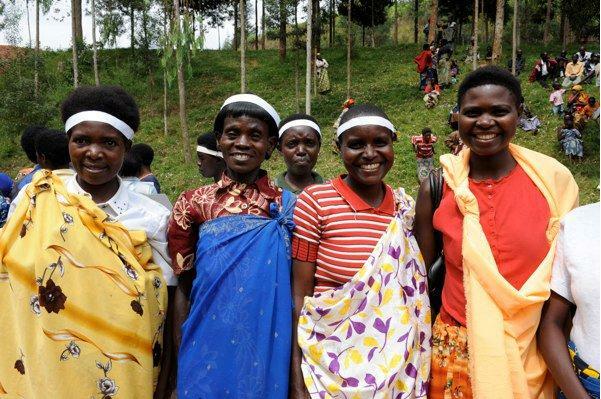 This three-year program funded by USAID will train 6,200 women in North and South Kivu provinces, with the objective of ending sexual violence by promoting rights and economic opportunities. 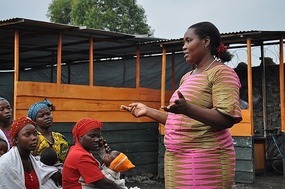 3,100 women started their training in January, 50% of whom live in and around Goma. Because of the vacillating conflict, these women are experiencing the social consequences – making it extremely difficult to access education, receive health care, and work to survive. Through Women for Women International, Project Espoir creates the linkages for the women we serve to economic opportunity, psycho-social support, medical care, and a foundation from which to rebuild their lives and their families. Today marks the half-way point for the groups of participants who started in January. On July 5th, they commence skills-training, which follows the basic life-skills and rights education, numeracy classes, and business skills training they already completed. Patrick takes me to an unconventional training session that is just about to begin. Six groups have come together in the courtyard of the training site to hear testimony from two WfWI graduates on how their lives have transformed following the program. Written in big letters across the blackboard reads: SOMO YA KUMI. BAHATI YA KUONGEZA PATO. Which translates: Topic #10. Increasing Economic Opportunities. The first woman to speak is named Nyankwa. She has a regal air about her, swathed in orange from head to toe. She graduate from the program in 2009 and is telling the current participants how she used her sponsorship funds received each month. She advises them to initiate their own projects to generate an income – even if it starts out small. She started by buying a 2 kg. sack of flour from which she made and sold donuts. 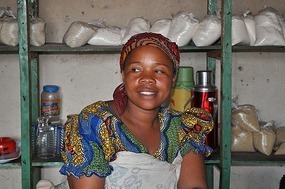 She continued to reinvest her sponsorship funds into her small business and is currently buying two sacks of 100 kg. each, making and selling donuts to a number of partners who purchase her products to sell themselves. Each week, she would carefully listen to her trainers and make sure that she attended each and every class. This is where she learned how to manage and grow her small business and how to attract new clients. She is now diversifying her business by selling other items at her kiosk – bananas, eggs, and even her own sacks of flour. She learned to listen to what her clients requested, and to anticipate the needs of her environment. She was able to grow her capital through this diversification of products, but was only able to start her now burgeoning business with the first $10 she received at Women for Women International – an opportunity she did not have prior to the program. Faida Telling Women to Invest in their Futures. Following Nyankwa’s story, you could see that the current participants were sitting a little closer to the edge of their seats. The stage was set for the next testimony from a graduate named Faida. Faida said she was very happy to see the new participants and assured them that their training will bring change. She mentioned that her story is different from Nyankwa’s. She is a divorced woman, abandoned by her husband and left to care for her five children alone. Prior to the program, she did not have a home and was living on the streets with her children. She was introduced to Women for Women International at one of the lowest points in her life. She started receiving training and bought a sack of cement with her first sponsorship funds for $10. She said she had no idea what to do with it, and just kept it with her other things, not using it. She then sold the cement for $15, using $5 for basic needs for her children and the other $10 on another sack of cement and some nails. She set up her own table selling the 2 kg. of nails she purchased. Each month she would buy and resell bags of cement and more nails to sell at her table. She stressed to the women not to neglect small business and what is most important is how to use the sponsorship funds each month. She tells them that they must sacrifice luxuries: no hairdressing, no new clothes, no beer. Their priority is to increase their capital. Participant Learned to Count in Numeracy Program. At the point where she started receiving regular clients, Faida’s children were chased out of school by the headmaster because their fees were not paid. She wrote to the headmaster, promising the payment in a few weeks time. She bough long sticks of sugar cane and cut them into smaller pieces, selling these along with her nails. The next month, she was able to finance her children’s education. She tells the women to take this opportunity with both hands and adopt a new behavior to change their economic situation. There is now a fluttering of activity in her life revolving around her children: she pays school fees, buys second-hand clothing, provides them protein-rich food, and keeps them clean and healthy. No longer do they sleep in the street. No longer are they chased out of school. She says she has now made a jump in her life and her foundation is Women for Women International. Her training filled her head with new ideas and she is now putting them into practice. She is amazed that people in other countries are offering them help and support. She emphasizes to the women that these are funds that they do not have to pay back, so they should be clever in how they use them and raise themselves and their families up. Recently, a relative of Faida offered her a plot of land because she saw how dedicated she was to changing her life and supporting her five children. She is now building a house that has two floors. She has healed from the misery of the past. The women erupt in applause and ululations. A participant stands up and says that she is like Faida and found out about Women for Women International while living in the streets. She said she recently learned how to count in her numeracy training. Before she could not tell the difference if someone gave her one dollar or twenty dollars. The other women shouted, “Count, sister!” And she began – One! Two! Three! Four! Five! More applause and ululations. She said that before learning to count it was as if she was a blind woman. Now she cannot wait to learn to write her name. After the testimonies, I was asked to address the women. What hard acts to follow! I told the women where I am from and that I work at Women for Women International in America. I echoed Faida’s advice of working hard throughout their training and taking this opportunity with both hands. I added that there is another pair of hands from their brothers and sisters in other countries, who are there to support them, encourage them, and offer them the start they need to make a new beginning. I ended by congratulating Nyankwa and Faida for the ways they turned their lives around. Next time I am in DRC, I said, I hope that Faida has added a third floor to her home, and that I can stay with her upon my return.